The iPad 3 rumor mill has shifted away from pure speculation toward acceptance that the next generation Apple tablet truly is imminent. NextWorth.com, a site that deals in buying and selling used electronics equipment, suggests that now is the prime time to trade or sell your iPad 2. I recently theorized that Apple could adopt a similar strategy with its tablets, as it has with the iPhone. Although the iPhone 4S is the current flagship smartphone, Apple is still producing the iPhone 4 as a more economical option, and the iPhone 3GS is available from AT&T for free with a two-year contract. 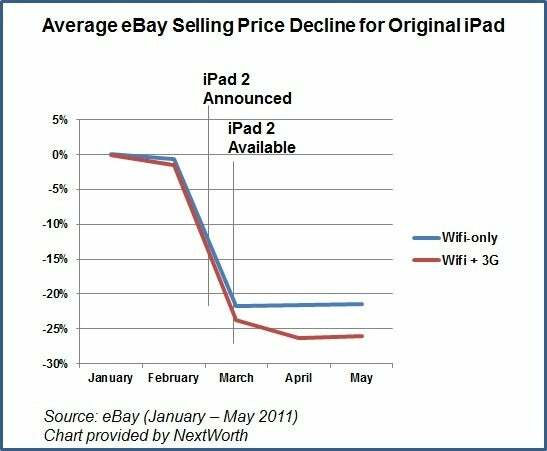 This chart from NextWorth.com illustrates the steep decline of the value of the original iPad. Whether or not that turns out to be true, one thing is virtually guaranteed: when the iPad 3 is announced the value of the iPad 2 will drop, and when the iPad 3 is actually available, the worth of that iPad 2 will plummet precipitously. According to NextWorth.com, the value of the original iPad experienced a steep decline following the announcement and availability of the iPad 2. Based on the historical data, we are already inside of the window where the perceived value of the iPad 2 could drop significantly. With the iPad 3 unveiling rumored to be March 7 or some time close to the first week of March, every day you continue to hold on to the iPad 2 is a bit of a gamble. As soon as Apple sends invitations to tech media for the event, or confirms even the slightest details, the iPad 2 will lose value. If Apple does in fact follow a similar strategy to its iPhone line and continue to offer the iPad 2 as a discounted model of the iPad line, that will make the value your used iPad 2 even less. If someone can get a brand new 16GB Wi-Fi iPad 2 from Apple for $400 or less, they’re much less likely to pay as much for your used one. The strategy of selling off previous models to make room for the newest one has served me well when it comes to the iPhone. With five lines on my Family Plan, there is almost always at least one line eligible for upgrade. I get the hot new model of the iPhone, then turn around and sell my old one on Craigslist or some other classifieds site for as much or more than the new one cost me. The iPhone is a slightly different situation, though, because of the wireless carrier subsidy. The iPad costs what it costs, but the iPhone is generally $200 with a two-year contract. However, buying it outright can cost $500 or more. Inevitably, there is someone who broke or lost an iPhone that's still under contract, and they're more than willing to pay $200 or more for a used replacement. I won’t be selling my iPad 2, though. It will simply be re-allocated within my home. Perhaps it will go to my kids as the gaming iPad, or maybe we’ll assign it to the kitchen as our digital cookbook. It will continue to serve our family in some way. But, if you have an iPad 2 that you’re planning to sell so you can get the funds to purchase an iPad 3, there is no time like the present.